Progress…. of a sort ! As September draws to a close, the new website is all but ready, awaiting a final run through and couple of images – frustrating how getting the right product in use shot takes sooooooo long ! The new Product prototype has been set up and put to the test – initial impressions are good. Air movement is far higher than the Fan-Ce – mainly as a result of the blade set up. Still some work to do to get it market ready. 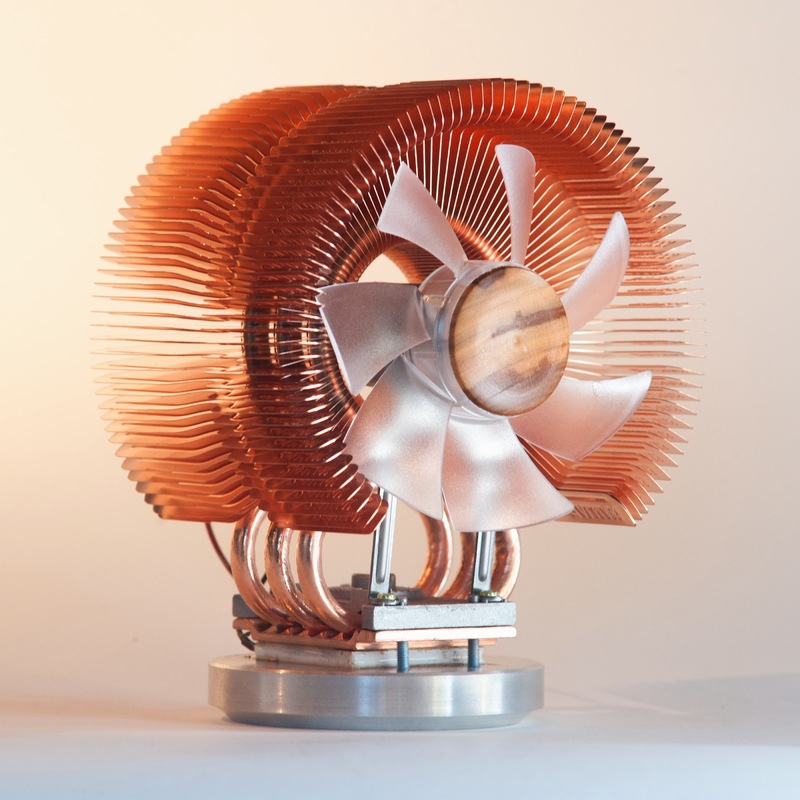 We took a stroll through YouTube this week and surprise surprise several new videos uploaded on ‘How To.. & Buy my Stove Top Fan’ with lots looking similar to the Fan-Ce – flattering I guess – but I wonder how serious these ‘project are’ ? 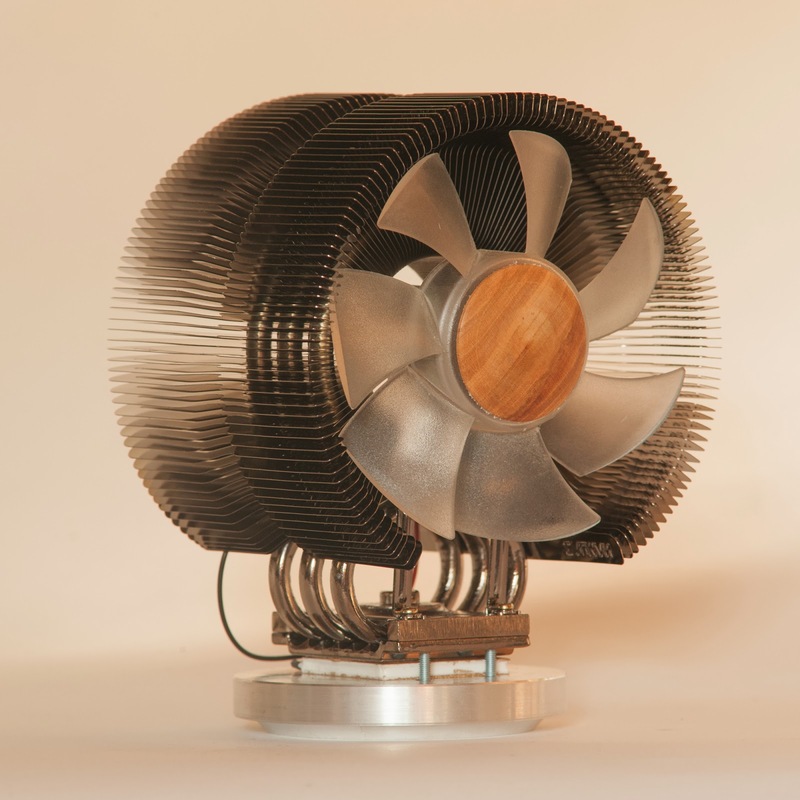 We continue to scour the used market for Black cooler bodies and whilst the larger series Fan-Ce have been purchased and converted & most sold, the small units remain very similar to rocking horse teeth in terms of availability. The sun is out, the solar PV is running and I have fire wood to cut, chop & stack and fan parts to make on the lathe. My life today is full of distractions, in that there are just so many things to take the focus off of what I am ‘trying’ to do. Every now and then I get the chance or stumble up on, something which actually makes me stop, think and puts me back on track. Last night was a good example. I attended a networking meeting in the Peak District Dales town of Bakewell, attended by a group of approximately 30 ‘like minded individuals which share a common interest’ – there were a number of speakers myself included – un-prepared as ever ! Always good to catch up with friends made through business. After the comfort / snack break, I sat and listened to a well written short presentation by a local chap, Paul Cox – he grew up in the village next to mine – Chapel en le Frith in the High Peak, Derbyshire. It was clear he had spent quite some time building up his presentation which was very personal to him. Paul Cox of Spin Less Plates builds small business software; as a micro business he experiences much the same as I do and many others like us. The thrust of his presentation was (as I suspected he had been asked) to highlight the benefit of a ‘Master Mind’ approach – that is to say two heads are better than one and 3 than 2 etc etc. All true enough and we could all benefit from fresh perspective and networking with others especially those which a are head of their game. A read once that you can only improve your chess game by getting beaten by a better player. However, for me Pauls’ motivational talk re-focused my own perspective on the WHY do I work for myself doing what I do – it is the question we should all take time out to re-assess. It is not my intention to put into type my ‘WHY’ – if for no other reason than my own privacy. Just to say that if I can give one bit of advice to any would be micro-business builders – ask yourself WHY. It makes all the other questions and answers flow far easier. Talking of distractions, too often these take us further from the WHY on occasion to the point where we have in fact lost track of the WHY and replaced it with a BECAUSE – in an attempt to justify to ourselves at least the fact that we are ‘off target’. Caught up in the ‘production of components’ earlier in the week and for a brief period having lost track of the WHY as I moved materials around the workshop – my attention was re-focussed by a ‘distraction’. Not the kids, or one of the various pets which come to visit the workshop… cats, chickens or dogs. Not one of my retired former work pals. This came in the form of a streak of Blue & Orange with a very long sharp beak and pretty nearly collided with the back of my head. 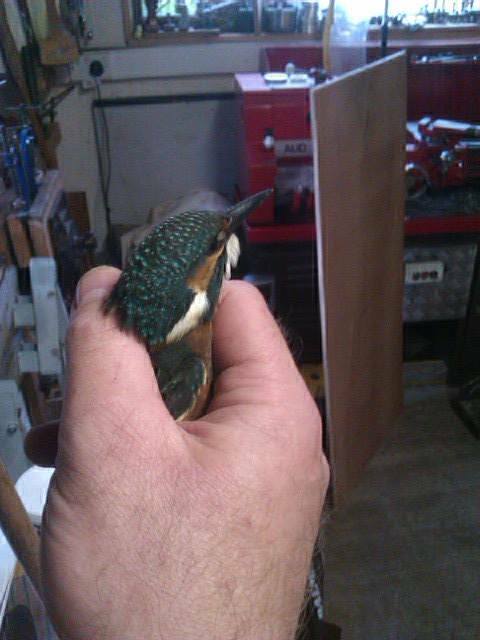 After a few seconds of the poor thing getting lost in the workshop I recovered it from the window ledge and released it outside – it set off as they do with its load SQUEEK and characteristic jet speed back toward the small stream beyond the workshop. The kingfisher – a bit of a ‘Grab Shot’ left handed with my mobile phone – still not many can claim to have held such a bird in the UK – protected as it is. Fiesty little thing as well. Stunning colours and quite a few years since I have seen one locally. After a week of running about after others and fitting in production time as and when I could – these simple few seconds of wonder made me re-focus on my WHY. I have to get out with my Nikon and do more of the things I like; creating new things, solving new challenges – which brings me to a new project for the Stove Fans – watch the blogs for more news soon. WHY – well because I want to. ! September has arrived and whilst we have built some finished goods stock of all models we will be making up components on the lathes. A shame that the local recycled metal yards have no suitable scrap aluminium to convert – the last of the scrap bar stock was converted in August with good results. So this morning we took delivery of several hundreds pounds worth of new bar stock – having had the practice on the scrap material – the processing of decent quality material should be fairly straight forward. The main difference is that at 3000mm length & 3600mm I was not going to be able to get this into the workshop and feed it into the saw. The supplier offered two free handling cuts per stock bar. At 1500mm long the half lengths are far easier to maneuver – a few minutes at the saw and each length was cut down to 500mm ready for turning down the diameter to the required size for the fan hubs. The longer lengths of 76mm diameter bar stock for the base discs still weigh a fair amount and as such will require some considerable care in handling the cutting down to 15mm blank lengths. Every dent on the outer girth requires more machining off to give a clean finish. The heat generated on the band saw without coolant is fine for the initial 15 minutes of cutting after which the stock length is too hot to hold without gloves – slow and steady with two lengths alternating every 10 minutes gets over the issue of heat. Despite all the handling issues it still works out far more cost effective for the conversion of the bar stock into blanks rather than buying in pre-cut or finished components – the production volumes being in the hundreds rather than the 1000’s at this stage to minimize the cash required for the business. Well work is underway. A little later than I had hoped falling as it does at a a time when the schools start up again and school runs, homework etc etc eat into the available time. I foresee some late nights and weekends playing catch up. I have in mind to video some of the production work and include sequences on the website and here within this blog to provide a perspective of the micro business …… just need a digital video camera for a few days …. Nice to see the existing website interest picking up for the season – sales for Sept’ are ahead of Augusts already, encouraging and rewarding to see the investment funds slowly being replaced. Now where can I get my hands on a Nikon DSLR with video facility ?